Hurricanes have been the bane of my triathlon schedule for the last month as race after race was cancelled. Sandestin, Nicholls State Bayou Tri, Cajunman and Holy Toledo all fell victims to Hurricane's Gustav and Ike. The Hi-Fi tri at the end of October is yet to be decided but I'm sure that it will be cancelled as well because it's in Galveston, Texas. Last I checked, what's left of Galveston is still recovering from its bout with Hurricane Ike. With all the race cancellations it sure was nice to have a tri on the schedule that was still on. 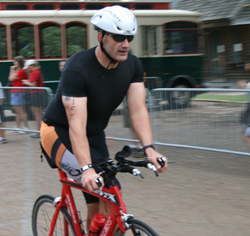 The 2008 Meat Pie Triathlon in Natchitoches, LA was that tri and this is my account of it. So what is a meat pie? Meat Pie - A savory pie with a filling of meat and other savory ingredients, usually made of beef, pork, venison or lamb but may also contain fish. Meat pies are included in a tradition of savory pies made with the intent of being served as the main course rather than a dessert option. The basis of the pie if, of course, MEAT, which is cooked before being mixed in with the other pie ingredients to ensure that it is thoroughly cooked and soft enough to cut with a fork. So how, as a former fat boy, could I pass up a triathlon that was named after two of my favorite foods? MEAT AND PIE! I had to do this tri! 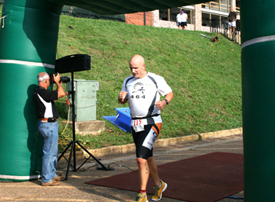 The Meat Pie Triathlon is held in Natchitoches, LA which is situated nearly halfway between Alexandria and Shreveport in central Louisiana. Natchitoches is known for it's meat pies and more recently as the fictional city that the movie Steel Magnolia's was filmed at in the late 1980s. I admit, the town does have a special ambiance that you won't find in most towns of its size. Maybe it was just me still being excited that I was about to run a race named after meat and pie. 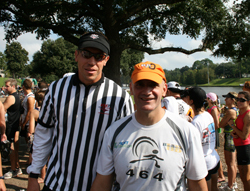 My tri club, Baton Rouge Tri, was donating rooms to members that were participating in the event. This year the Meat Pie Tri would be the site of the USAT State Club Championships. The more members we had in attendance for the race, the better shot we had of taking home the coveted USAT State Club Championship trophy cup. After close to a 3.5 hour drive from Baton Rouge we arrived at the hotel. Beth joked that the Holiday Inn Express was a major jump up in quality from the Motel 6 jobs that we usually stay at. We had just enough time to unload my bike and my gear and head down to the riverfront to meet up with some fellow BR Tri members. After picking up my race packet we grabbed a quick dinner before the LSU vs Auburn football game started. We had originally planned to watch the game at the restaurant but it was too noisy and I forgot my glasses so we went back to the hotel just after the first quarter ended. We watched the remainder of the game on the big screen in the lobby. The outcome was favorable as LSU pulled out a win in the 4th quarter. I despise Auburn but I always enjoy the game because they always seem to play LSU tight. I knew the race kicked off at 7AM so I made sure to get in bed for 10PM to ensure a good nights sleep. I planned on getting up at 5AM but, like clockwork, I was up at 4:30AM, wide awake, excited and ready to race. I stared at the ceiling and contemplated my race strategy in my head. What I really wanted to concentrate and improve upon for this race was my time in transition. I played out both transitions over and over in my head going over the small stuff such as putting on my shoes, donning my glasses and snapping my helmet. The small stuff adds up and I know that I could move up a few slots on the finish time list if I improve my transitions. I had a goal to go sub 2 hours in the race so I knew that having good transitions was a MUST. Before I knew it, 5AM rolled around and all my alarms started blaring. I hopped out of bed, loaded my gear and was ready to go in record time. Beth? Not so much. She didn't care too much for the early rising but she got up all the same. We still managed to get out of the hotel for 5:45AM or so after a quick bite to eat at the breakfast bar in the lobby. It was still dark as I rolled my bike into transition. 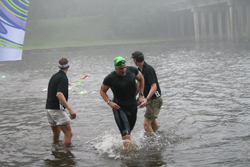 The race director announced that the water was 77.9 degrees which meant that the swim was wetsuit legal. (78.1 degree water and wetsuits aren't allowed) Shucks, I didn't bring my wetsuit so I would have to deal with the chilly water. I meticulously arranged all my gear and was proud that my transition area is no longer 'diva-like'. I would even say that it's almost rather minimalist now. I don't wear socks anymore so the only thing I had out was my bike shoes, my running shoes and my Team 464 jersey which I slip on when I leave T2 for the run. After filling up my water bottles and going for a quick run I grabbed my goggles and strolled over to the swim start to line up. The swim start at Meat Pie is similar to what Heart O' Dixie did as a time trial. The swim was open water in the Cane River but they still do a time trial start which means that the first person starts then five seconds later the second person starts then five seconds later the third person starts and so on. I never quite understood exactly why they would do a time trial start in open water. I understand why they do it for pools but not for open water. I guess they want to limit the amount of participants out on the bike course at one time. My bib number was 115 so I had a few minutes after the first swimmer hit the water before it was my turn to hop into the drink. Pat Keenan and Murray Fontenot, fellow BR Tri members, were numbered close to me so we chatted for a bit while the line edged closer and closer to the starting point. We joked about the assclown that grabbed my ankle, pulled himself over my back and then kicked off on my shoulders at my last race at River Cities. Time passed quickly and before I knew it, it was my turn to start. The race director motioned me to get ready, counted down from 5, then gave me the go ahead. Meat Pie for me had officially started as I slid into the chilly water. The water was definitely cold. It was much colder than anything I had swam in without a wetsuit but thankfully after the first 100 or so meters it felt comfortable. I'm sure I wasn't alone sighting the buoys since a heavy fog lingered over the water. I drifted way off course and had to be corrected by race volunteers in a canoe back onto course. I did my best to sight but I couldn't see the buoys. I blindly drafted on the feet of the nearest swimmer I could find, hoping that they were having a better time seeing the buoys that I was. After another 100 meters I saw the orange, triangular goodness which was the first buoy. I passed the buoy thinking to myself, even though I drifted off course, I was making good time. My swim has improved by leaps and bounds from the beginning of the year. I no longer am even the least bit anxious or concerned about or during the swim. It's merely a warm-up for the bike and run. I'm very confident that I can do the 2.4 mile Ironman distance swim now well within the cutoff time of 2 hours and 15 minutes. My stroke is nowhere near as efficient as it probably could be if I got more lessons or swam with a local masters group but it's not bad. I swim for distance, not for speed and I can go for an indefinite amount of time without getting tired. When I reached the turn around point in the swim the fog seemed to lift a bit and I could finally see the buoys on the way back in to the swim exit. I finished the swim in record time for me and trotted into transition. T1 went great. I got all my bike gear on quickly and was out in just over 1 minute. Compared to my 3 minute or so average T1 times in my other races this was a VAST improvement. I rushed up the big hill that led up over the levee out onto the bike course. Some people tried to brave that steep levee hill and from what Beth told me many had some unintended results by falling over halfway up. The first thing I noticed when I got out onto the course is that my bike computer wasn't working. Good thing I had my Garmin Forerunner 50 watch as my backup. I twisted my watch to my forearm so I could eye my speed and distance and didn't miss a step. In short, I had a great bike! I passed at least 25 people and maintained a 21 mph average throughout the course. I was passed by one participant but I ended up passing them back just after the turnaround point at the 10 mile mark. The course was much more hilly than I anticipated and I caught some serious speed going down one of the hills on the way back into T2. At one point my watch was displaying 42 mph! I believe it because I didn't bother coasting down the hills. I stood up on my bike and hammered my way to the tops of the hills and then geared low, got aero and hammered my way down the hills. Rinse and repeat and before I knew it I was getting close to transition. Meat Pie Tri would be my first attempt at a flying dismount. I guess someone should have told me not to take your feet out of your shoes when you are 2 miles out from transition. Like a dummy, I slipped my feet out of my shoes and peddled with my feet on top of my shoes for the last two miles of the course. I guess I was just excited to be attempting my first dismount in a race environment. With about 40 yards to the dismount line I flipped my right leg over the bike side saddle and and executed my flying dismount perfectly as I stepped down onto the dismount line and sped into transition. T2 was equally as quick as T1. 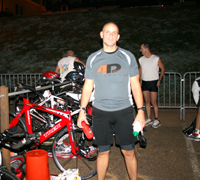 Having my feet already out of my bike shoes and a little running momentum heading into transition helped tremendously. I quickly slipped on my running shoes, donned my Team 464 jersey and I was off to the run course. Just over 1 minute again for T2. My average in T2 for all my races this year was also around 3 minutes so, at just over 1 minutes, it was a great improvement. The beginning of the run course starts with a trip up a staircase. I hit the bottom of the stairs and thought I would "Rocky Balboa" every other step to the top. That idea lasted maybe 3 revolutions before I was breathing heavily and had to resort to hitting every step. I didn't have the best run but I maintained a 8 - 9 minute pace throughout. The course ran across a bridge that crossed the Cane River then turned left down the historic Natchitoches riverfront street that was shaded by an ageless oak tree canopy. The sun was out in full force at this point but the weather and the temperature was perfect. 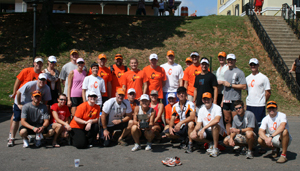 Most importantly, throughout the entire run, I never experienced any gastric distress which for me makes a successful race. I reached the turn around point and quickened my pace for the remainder of the run. I crossed the bridge, took a sharp right on the levee street that headed towards the finish line. I finished strong... I finished in 1:56.18... I broke 2 hours which was my goal for the race. BR Tri also ended up taking home multiple first, second and third place winners and most of all we took home the USAT State Club Championship trophy. Overall a great race and I hope to run it again next year and beyond. Thanks for reading. I hope you enjoyed reading my account of the Meat Pie Triathlon as much as I enjoyed writing (and living) it!